This is to inform the general public that the sale of 2018/2019 Academic Session Online Application form has commenced on the 16th of July, 2018. Kindly log on to the Polytechnic website www.bupoly.edu.ng and apply. The Polytechnic was established to provide full time training in various capacity, leading to promotion and advancement of knowledge both within the state and country in general. 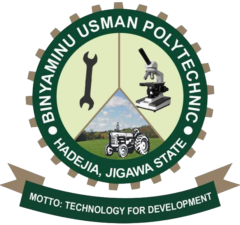 Binyaminu Usman Polytechnic, Hadejia, Jigawa State of Nigeria was established to provide full time training in various capacity, leading to promotion and advancement of knowledge both within the state and country in general. As a specialized College is committed to the training of skilled and innovative work-force that would transform Nigeria’s natural resources into goods and services, driven by entrepreneurship and Information and Communication Technology (ICT) to positively affect the economy and thus the quality of life of her people.